Hip fractures result in high death rates for older adults age 65+ and accelerated death rates for older adults diagnosed with dementia. The level of physical condition, ability to complete activities of daily living, and time to surgery contribute to the level of recovery and return to prior abilities. Participation and support from family caregivers is critical when aging parents and family members experience significant accidents or injuries, like hip fractures. Advocating with physicians, especially for family members diagnosed with dementia is critical due to physician bias. Physicians hesitate to perform surgery for hip fractures for older adults diagnosed with dementia. The ability to physically recover, especially for family members diagnosed with dementia, is in direct proportion to the time family members or paid caregivers are able to commit to daily care. Extreme advocacy is required for successful recovery. Individuals residing in the community had a 13.2% mortality rate versus residing in assisted living at 23.7%, and in nursing homes at 30.7%. Individuals with dementia have higher mortality rates at 29.3% versus persons without dementia at 13.9%. The time between fracture and surgery is also critical. Delays of more than 2 days increases 30-day mortality rates by 17%. Advocating for surgery as soon as possible, within 36 hours, offers the best opportunity for recovery. Older adults remaining in the hospital for lengthy periods of time are more susceptible to blood clots, pneumonia, and pressure ulcers on the skin that are difficult to heal. Physical weakness increases with age for a variety of reasons. Difficulties performing activities of daily living become more challenging with the diagnosis of multiple chronic diseases. Hip fractures easily occur. A lack of daily physical activity adds to the concern of weakness, falls, and hip fractures. After age 65, the saying “use it or lose it” is a daily mantra for older adults wishing to remain physically and mentally active. Diagnosis of chronic disease increases the likelihood of physical frailty and hip fractures. Arthritis makes it difficult to perform tasks that require hand grip, like buttons, zippers, and opening food containers. Physical movements like standing, walking, and bending may be painful. A diagnosis of COPD affecting the lungs, or a diagnosis of congestive heart failure, makes it difficult to breathe when completing activities that require physical exertion. Individuals feel like they are gasping for breath and tire easily. The ability to complete activities of daily living that most of us take for granted becomes more difficult with age when multiple chronic diseases exist. Older adults feel uncomfortable, unsafe, or afraid when attempting to enter the bath tub or shower. Activities like dressing, bending over to put on shoes, or walking down steps to go outside to bring in the mail require planning and coordination skills to avoid a fall. Physically moving in and out of bed, standing from a chair, or rising from the toilet may take thoughtful effort. Older adults become “stuck” in some of these situations and need physical help to complete the activity. Supporting daily activities by evaluating home safety and using assistive devices can reduce the likelihood of falls and hip fractures. Family caregivers can review the home and visit local equipment stores or shop online for items to support safety. The activity of purchasing and installing safety devices can be completed while the older adult is in rehabilitation for a hip fracture in a skilled community. Rehabilitation staff from communities are often willing to complete a home safety assessment and make recommendations. Family caregivers are instrumental in supporting aging parents and older family members. Routine visits provide support with many of these activities of daily living. In home caregivers are another option for supplementing the support provided by family caregivers. Adapting the home situation to avoid falls and accidents is important to support the desire of the older adult to live at home. Falls that result in serious injuries—like hip fractures—make returning to a regular daily routine difficult. Regaining physical strength after an injury requires considerable effort and participation in ongoing physical therapy and exercise. Climbing stairs inside the home can be unsafe if poor balance and physical weakness exists. Movement after recovering from a hip fracture may be painful. Family caregivers can install double hand railings to allow hand gripping on each side of the wall. Installing a chair lift is another option if the staircase is wide enough and the cost of the lift is not prohibitive. Another option is moving the bedroom, or placing a bed, on the floor of the home where the bathroom and kitchen exist. This may eliminate or reduce the need to climb stairs. Tips to make the bathroom safe include: installing grab bars both inside and outside of the bathing area, adding a bath seat and non-slip bath mat in the shower or tub, installing a hand-held shower head, and adding a toilet riser with arm railings to assist in standing from the toilet. Remodeling may be practical to add a walk-in or roll-in shower. Installing a high-rise toilet and higher bath counters and sinks are options as well as widening doors to accommodate a wheelchair. Family caregivers can assist in making the right decision to support bathroom safety, whether safety equipment or arranging for partial or full remodeling. Older adults who find the kitchen difficult to navigate are less likely to make use of the room for food preparation. Appliances with automatic shut offs are a good idea to avoid burnt pots or pans. A microwave with easy to use instructions may replace use of the stove. Lower shelves with easy to reach dishware and food storage avoid standing on step stools. For easy clean-up, a hand sprayer for the sink and the addition of a dishwasher if one is not already available. Many older adults use pieces of furniture to support themselves as they walk around their home. This is called “furniture walking”. Moving from couch to chair to table while grabbing for and holding onto furniture is unsafe. If holding onto furniture is used for balance and to prevent a fall, it is time to talk to the doctor about using a cane or walker to avoid a fall or hip fracture. Older adults view using canes and walkers as a negative. I hear “only old people use those things.” Setting aside pride increases safety. Canes and walkers provide peace of mind for the older adult and family caregivers that efforts are being made to avoid falls. Arthritis and hand flexibility affects working buttons, zippers, and pulling clothing over the head. When continence becomes an issue, Depends and other supportive briefs are available. Elastic waist slacks, pull over shirts or blouses, shoes with Velcro and similar items make dressing easier and safer. Assistive devices like “sock assists” and shoe horns make dressing easier. Older adults have homes with basements where cleaning supplies and the washer and the dryer are located. The addition of double railings on steps was addressed above however if possible, move the washer and dryer to the main level of the home. If not possible, family caregivers or paid caregivers can assist with laundry and bedding changes. Hoarding is sometimes a concern for older adults who have memories of the Great Depression and scarcity of food and other items. Many older adults have basements, closets, and rooms full of items that are rarely or never used. Clutter creates a significant fall risk when rooms are filled with furniture, and piles of paperwork, boxes etc. are everywhere. Excess items make walking in the area difficult, present a fire or rodent hazard, and make the idea of moving seem impossible. De-cluttering may take concerted and weekly effort through joint participation by the older adult and family caregivers. Attachment occurs with items that may be sentimental. Remove or donate items that are no longer needed. Be cautious of entry way stairs, front, back, and access through a garage area. Make certain that railings are installed where possible. Install additional railings on the outside and inside of doors at a level where the railings can be gripped for balance. Also install a lock box with an extra key in an area that is not noticeable by the general public. This lock box allows family caregiver access if for some reason the telephone or the door is not answered. While pets are “man’s best friend” and may be a comfort to an older adult, it is important to make certain pet items are not the cause of a fall. Create an area for a pet bed and pet toys so that they can be grouped and are not all over the home and underfoot. Install a dog door if possible that leads out to a fenced area to avoid having to wake at night and let a pet outside. Set up dog bowls for food and water in an out of the way location. Purchase automatic feeding and watering machines to limit bending and the possibility of a fall. If needed hire a pet walker and someone to ensure that food and water are always available for pets. When the home becomes a burden and safety concerns are constant, it may be time to consider moving to an environment that is safe and where needed care is readily available. Moving is a permanent decision. It is important to give a care community great thought and consideration. By reviewing areas of the home that pose safety concerns it may be possible to reduce the likelihood of a fall that results in a move from the home. Older adults want to remain at home as long as possible. Family caregivers are able to support the desire to remain at home by evaluating the home, and assisting with the purchase and installation of safety devices. Changes in the home environment may be unsettling for older adults who dislike change. Discussing that safety is the main concern may alleviate worry or stress about safety additions. Hip fractures are serious injuries that may result in an older adult being forced to move from a home to a nursing home. It is important to understand that taking small steps in planning for increasing needs provides peace of mind for both the older adult and family caregivers. This type of planning avoids hip fractures, other unexpected accidents and crises situations that may be emotionally upsetting for all involved. © 2018 Pamela D. Wilson, All Rights Reserved. 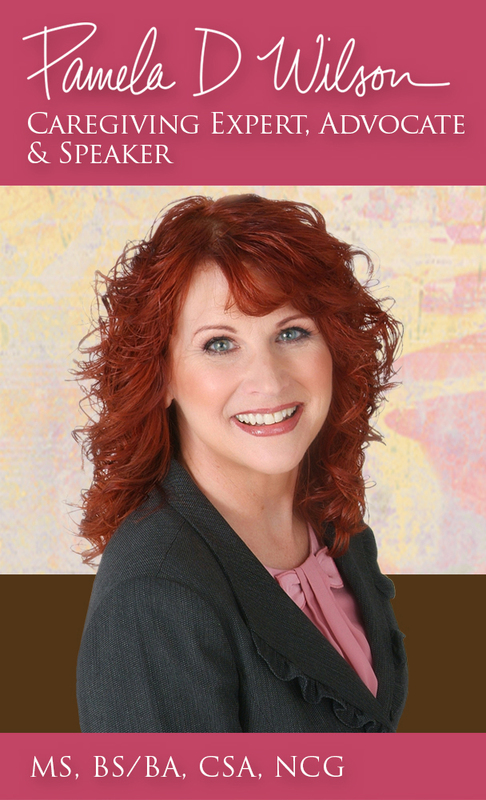 Pamela D. Wilson, MS, BS/BA, CG, CSA, is a national caregiving thought leader, caregiving expert, advocate, and speaker who solves caregiving problems. Online support and programs are offered to caregivers seeking support and advice for the care of aging parents, spouses, and other family members. Pamela supports adults, age 50+, with positive aging advice and online programs to advance health literacy and self-advocacy. Collaboration with professionals in the specialty areas of estate planning, elder law, and probate, financial planning, and healthcare raises awareness of and sensitivity to stressful family caregiving and healthcare issues.